Grammys and Records and Songs…and Charts! On Sunday night, February 8th, at 8pm, the 57th Annual Grammy Awards ceremony will take place in Los Angeles. It will air on CBS and be hosted by actor LL Cool J for the fourth-consecutive year (I believe only Andy Williams has hosted more consecutive shows). The Grammys have been seen as the premier awards ceremony for the music industry – sort of the Academy Awards for music – almost since its inception in 1959. Its first television broadcast occurred with the 13th Annual ceremony in 1971. The various other music-related awards and their telecasts (e.g., American Music Awards, Country Music Awards, BET Music Awards, MTV Video Awards, Billboard Music Awards, etc.) can all thank the Grammys for creating the venue, although they typically are still out-performed in TV ratings by the grand-daddy of them all. The first version of the Grammys recognized only 28 categories, this year’s Grammys will be awarded in 83. As with previous years, the nominees (chosen by a complicated voting process involving industry insiders, not you the public) range from relatively unknown or fledgling artists to aging sentimental favorites (who never received their just due when they were actually relevant and making good music) to current chart-topping artists whose critical acceptance (judging by their Grammy noms) is either equaled or exceeded by their commercial and chart success. And with this year’s nominations and tomorrow night’s awards – at least for those who care anymore – will come the usual grousing about which songs, albums and artists should or should not have been winners. If there’s one thing that the Grammys have been consistent about in their 56-year history, it’s the penchant for not being able to please everyone – fitting since music is eclectic and universal and, after all, that’s what it’s all about, right? Of this year’s 83 categories, four are considered the biggies, as they are every year. They are: Record Of The Year, Song Of The Year, Album Of The Year, and Best New Artist Of The Year. Album and new artist of the year are pretty self-explanatory, but it’s that record/song duality that usually needs some ‘splainin’ even after all these years. People today still wonder what is the difference between Record and Song of the year. Well, it’s actually very simple. Song of the Year recognizes the song’s writers. Record of the year recognizes the recording itself, i.e., the tune’s performer, producers and recording engineers. You may say, well what difference does it make – just combine the categories and give one award to everyone involved in the record’s success: the songwriters, producers, and artists involved. Well, the Grammy people – and apparently the industry itself – feel its important enough to make the distinction. And the evidence bears that out. Of the first 56 Annual Grammy Awards, only half of the Song Of The Year winners, or 28 of ’em, have also been crowned Record Of The Year. In some cases, but not as many as you think, the person who performed or produced the record is also the person that wrote the song, so the artist is recognized for his or her (or their) multiple talents. One would think that a song that was so critically acclaimed that it would take both Record and Song of the year awards might also be a huge commercial success, right? Maybe even hitting Number One on Billboard’s premier singles chart, the Hot 100, or perhaps being named by Billboard as the top single of the year? Well, of the 28 tunes that have taken both Song and Record Grammys, only 15 have also reached Number One on the Hot 100, and five of those ended up being the #1 single of the year in which they were hits. Coincidentally, the Billboard Hot 100 chart was inaugurated in August 1958 – the first year covered by the Grammys – and “Volare” by Domenico Medugno was only the second song to top the chart. It was named the Single of The Year by Billboard before winning the first-ever Record and Song of the year Grammys a few months later. That triple crown might have been an indicator of things to come, but it wasn’t. Only three songs in the 1960s won both Record and Song Grammys, and none of those – “Moon River” by Henry Mancini (1961), “Days of Wine and Roses” by Andy Williams (’63), and Up, Up & Away” by 5th Dimension (’67) – reached Number One. It wasn’t until the 1970s that the stars began to align for both Grammy and pop chart success. Five singles won both awards during that decade, and four of those reached Number One. As you can see from the above list, Roberta Flack did it twice in consecutive years (although she didn’t write either tune so she didn’t actually receive the Best Song Grammy herself). Roberta Flack and Simon & Garfunkel also had the biggest hits of the year chart-wise in 1972 and 1970, respectively. Since Paul Simon also wrote “Bridge Over Troubled Water,” he actually has the Best Song Grammy somewhere on his trophy mantle. The one song of the 1970s that won the two awards but did not reach Number One on the Hot 100: “Just The Way You Are” by Billy Joel. It peaked at #3 on the charts. 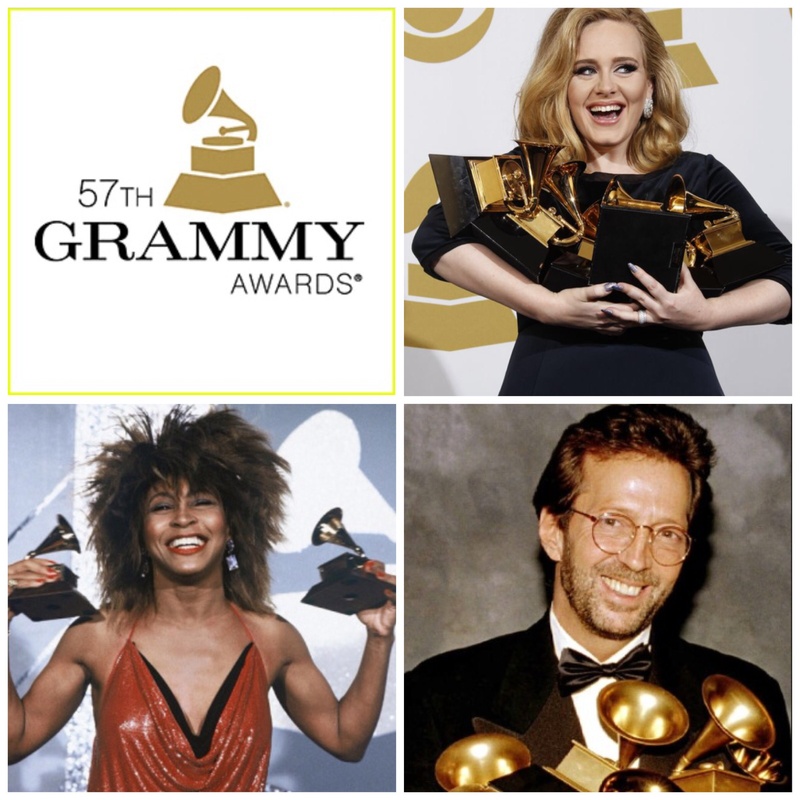 The Grammy gods and Billboard were even more in sync the next decade as the 1980s had six tunes achieve the triple-crown of Record/Song of the Year and Number One Hot 100 single. One of them, Kim Carnes’ “Bette Davis Eyes,” which she also did not write, was named Billboard’s top single of the year (1981) on the Hot 100. But the 1990s was the decade in which the most hits (seven) took both Record and Song of the Year awards. Of those seven, three of them reached Number One on the pop chart. The four that missed: Natalie Cole’s “Unforgettable” (1990), Eric Clapton’s “Tears In Heaven” (’92) and “Change the World” (’96), and “Sunny Came Home” (’97) by Shawn Colvin. Clapton’s “Tears” was a near-miss by peaking at #2 for five straight weeks. He also joined Roberta Flack as the only act to have two tunes win both Record and Song of the Year, and, unlike Flack, he was able to receive the songwriter’s award for having co-written one of the songs, “Tears,” written after his son tragically died in 1991. The song’s other co-writer, Will Jennings, also happened to write the lyrics to Celine Dion’s big triple-crown winner on the ’90s list: “My Heart Will Go On” (1998). With the new millennium came a drought in this category, as none of the four dual Grammy winners during the ’00s reached Number One on the Hot 100 singles chart. The Records and Songs of the Year in that decade were: U2’s “Beautiful Day” (2000), “Don’t Know Why” by Norah Jones (’02), “Not Ready To Make Nice” by Dixie Chicks (’06), and “Rehab” by the late Amy Winehouse (’07). That decade-long shut-out at the top of the Hot 100 for Grammy song/record winners hadn’t occurred since the 1960s. So far during the current decade, two songs have scored the double-Grammy, with one of those also topping the Hot 100: Adele’s “Rolling in the Deep” (2011), which she also co-wrote and, by doing so, she became the first female to actually win the Best Song award in conjunction with Best Record and a Number One hit). “Need You Now” by country trio Lady Antebellum was a near-miss in 2010, peaking at #2 on the pop chart – joining Clapton’s “Tears In Heaven” as the only two singles in this category. As for this weekend’s Grammy coronation, four songs are nominated in both the Song and Record categories, with two of those: Taylor Swift’s “Shake It Off” (which is still in the top ten) and “All About That Bass” by Meghan Trainor also reaching Number One on the Hot 100. Will one of them join the other 15 that have completed the trifecta and won both awards with a Number One pop hit? Since they both also wrote their hits, will they join Adele and become only the second female to actually take home the songwriter’s award as part of the triple crown? Posted on February 8, 2015 April 23, 2015 Categories My Lists, Trivia You Can UseTags Adele, Billboard, grammys, LL Cool J, Meghan Trainor, Number Ones, Shake It Off, Taylor Swift4 Comments on Grammys and Records and Songs…and Charts!